If you are between the ages of 1 and 99, you have probably heard Tony Award winner, Idina Menzel as the voice of Elsa in Frozen. If I had a nickel for every time I’ve heard her sing Let It Go, I would be a happy blogger indeed. So when the nice folks at One2One Network sent out a request for bloggers to review Idina Menzel’s Christmas CD, I hopped at the chance. Disclosure: I received a complimentary CD to facilitate my review. All opinions are my own. This post contains an affiliate link to my Amazon account. About Idina Menzel- We know her most recently as the voice of Elsa, from the super box office smash- Frozen, but Mrs. Menzel is a Tony award winning star of such Broadway hits as Wicked, Rent, Glee and If/Then. My daughters and I would have loved to see her in the starring role in Wicked, but can only dream that she will return to her Broadway career soon. In the meantime, we can listen to her sing some beautiful renditions of classic Christmas/Holiday hits on her new CD. On this 12 track Cd, Idina teams up with Michael Bublé for a cute duet of Baby its cold outside. And Mr. Kenny G makes a special appearance on Idina’s rendition of White Christmas. While both these songs are special in their own right, I loved that Idina added When you wish upon a star to her Holiday Wishes CD. Even though you’ll recognize some of these songs, in true Idina Menzel fashion, she has added her own special style to each song. Some are old school cool, some tracks have a bit of a Blues influence, but I think you will love what she has masterfully created just as much as we do. We have shared this CD so much; I never know which daughter has it in her room. We take it with us while running errands because the songs are so catchy and fun to sing along with. Please share in comments: What is your favorite Christmas/holiday song? 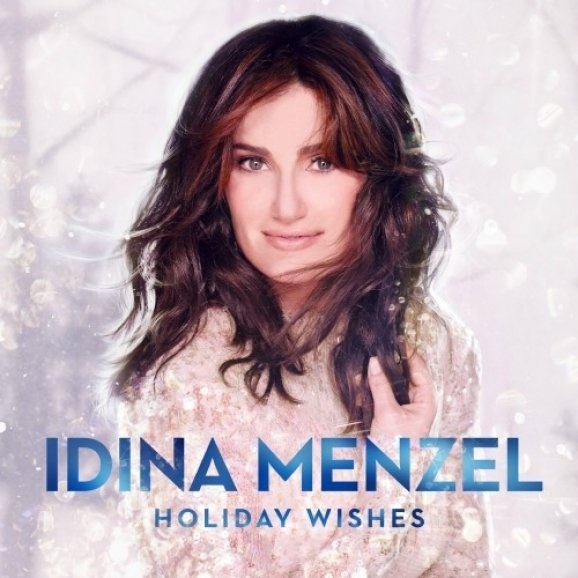 Read through the songs on Holiday Wishes and let me know if Idina sings your favorite! I have never heard of her. I may have heard the music and not known who it was. I, gasp, have not watched Frozen having all grandsons but I definitely know it and it's music. I saw her sing on a Christmas special last week and loved her.I will be listening to her in the future and who knows, maybe go watch Frozen. Yep, you have probably heard one of Idina's songs and not know it. Ha! I like your humor. I missed the Christmas special last week, but figured she would perform superbly. I love to hear Idana sing "Grandma got run over by a Reindeer"! Just kidding. I have not heard her CD, but like the fact that it has a good variety of songs. Have a holly jolly Christmas! I absolutely LOVE Idina. She has such a beautiful voice! thank you for sharing this, I had no idea she had this album out. Well, I love Christmas sings and I love Idina! Guess which new cd I'm buying! I love Idina's voice too. I'm pleased to share her newest CD with my readers. Right? It's a win- win here with Idina! Idina is one of the best singers out there right now. You should watch Frozen, I bet you'll like it. My daughter loves "Let It Go" and says Elsa has such a pretty voice. I bet she would love this for Christmas.